Fab Five alum and ESPN basketball analyst talks style and hoops with Men’s Fitness. Jalen Rose is a renowned trash talker from his days as freshman star as part of the Michigan Fab Five through his 12-year NBA career. His quick wit and access to information, no doubt a reason why he’s one of the most successful basketball analysts on TV. Rose once admitted that he would research his opponents so that he would be educated when he verbally torched them. He still does his research on competitors but now he’s watching what other on-air mouthpieces are wearing on camera. But not so that can rattled them with this words. Instead, Rose just wants to make sure that he finds a way to separate himself. Now for clarity’s sake, separating himself is not the same as wearing the fire red pinstripe deal with red gators Rose wore on the night of the 1994 NBA Draft – a suit that will forever live in NBA infamy. “I had a much different budget then,” Rose admitted. Now Rose is all about versatility. Viewers can see him in a two-button suit, three-piece or a more casual sweater-sports jacket-sneakers combination. But now, Rose is promising something special for lineup of Christmas Day games Thursday, starting with the Washington Wizards at Madison Square Garden against the New York Knicks. First, let’s all thanks Jalen for choosing the red pinstriped suit for Draft Night. His back-up suit was yellow with leather alligator-skin shoes. He also took some time to talk basketball with us since he’ll be hosting the four-game Christmas Day lineup. Men’s Fitness: Jalen, let’s get this out of the way first. Since the New York Knicks play the Washington Wizards in the first Christmas Day game, are you shocked that the Knicks have turned out to be this bad? 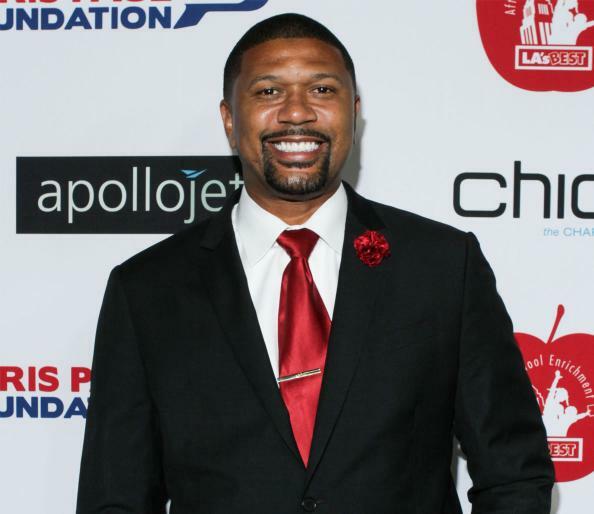 Jalen Rose: You don’t expect them to be historically bad. You look at the names. [Team president] Phil Jackson is the ultimate puppet master. [Coach] Derek Fisher has multiple championships. Carmelo [Anthony] is one of th best scorers in the game. Amare Stoudemire is a multi-time All-Star. Andrea Bargnari is a former No. 1 overall draft pick. J.R. Smith is a former Sixth Man of the Year. It’s really the beauty of the NBA. Everything happens from the top down. You can’t just look at the championship rings. Tim Duncan didn’t win with Pop [Spurs coach Greg Popovich}. Phil Jackson didn’t win without Michael Jordan and Scottie Pippen with the Bull and Kobe Bryant and Shaq with the Lakers. It happens from the top down. What do you think of LeBron James and his move to the Cleveland Cavaliers at this point in the season? In Cleveland, he’s the homecoming king. He’s an MVP but he needed to go to the puppet master too. He went to Miami and Pat Riley to win his rings and now he’s back in Cleveland. I really love Kyrie Irving and his handle and scoring. Kevin Love is great. I think the problem with their team is they’re going to struggle defensively. Golden State is an intriguing story. They own the best record in the NBA. What do you think of their chances in a loaded Western Conference? They’re the perfect storm of an exciting team that you can watch on a slow Wednesday night but also a team that can contend for a title. It’s like how chicks dig he long ball in baseball. In basketball, it’s the three-point shot and they’ve got great shooters with Steph Curry and Klay Thompson. OK, so before we enter 2015, who’s your picks to make it to the NBA Finals? I give the edge to the [Chicago] Bulls for what they hav up front with Paul Gasol and Joahkim Noah. You have an improved Jimmy Butler, who’s averaging 20 points a game and Derrick Rose is a former MVP. Then on the other side it’s go Spurs go. You have to go with the San Antonio Spurs when you see what they’ve done year in and year out. You’ve got to give it to the champs. Let’s backtrack a bit, how did you realize that you wanted to go into broadcasting? Last question, we’ve seen more and more public displays of protest lately with players such as Derrick Rose and LeBron James wearing “I Can’t Breathe” t-shirts and Cleveland Browns receiver Andrew Hawkins wearing a t-shirt to protest the shooting of Tamar Rice. You’ve always been an outspoken athlete, how do you feel about players voicing their opinions on social issues?